I had the great honor to serve as technical consultant on both of these projects. It was a distinct pleasure to work with Andrea Stillman again after so many years. Andrea and I worked together in Ansel and Virginia's home during the late 1970's. I was Ansel's photographic assistant and Andrea served as his administrative assistant. Along with our more mundane daily tasks (not much at Ansel's was ever mundane!) we assisted Ansel when he made the official portraits of President Jimmy Carter and Vice President Walter Mondale. We became close friends, and that friendship has remained strong over the decades. When I need to know something about Ansel's images, or his history, my first source for reliable information is Andrea. She has an encyclopedic knowledge of Ansel's photographs and his life. I learned a great deal working on both of these projects with Andrea. It was particularly interesting, and rewarding, to watch Andrea's book evolve over the past year. I had the opportunity to read numerous drafts of the twenty chapters that comprise the beautiful volume Looking at Ansel Adams: The Photographs and the Man. Each of the twenty chapters focuses on one of Ansel's images, but that is just the beginning. What makes this book unlike any previous publications about Ansel are the wonderful stories that Andrea weaves around his photographs. As Andrea says so eloquently in the introduction to the book and the companion app: "To glimpse him up close and personal, as I knew him, look at his photographs. They and their stories reveal both the man and the artist." Along with the insightful and interesting text, you will discover a number of unmanipulated "straight" prints, contact sheets, as well as fascinating personal and photographic artifacts, you have likely never seen previously, in both the book and the app. The book's official release date is September 25, but it can be pre-ordered at a discounted price right now from Amazon.com, along with other online as well as traditional bookstores. It is a hefty volume of 272 pages with more than 220 illustrations. The suggested retail price is $40, but many resellers offer substantial discounts. 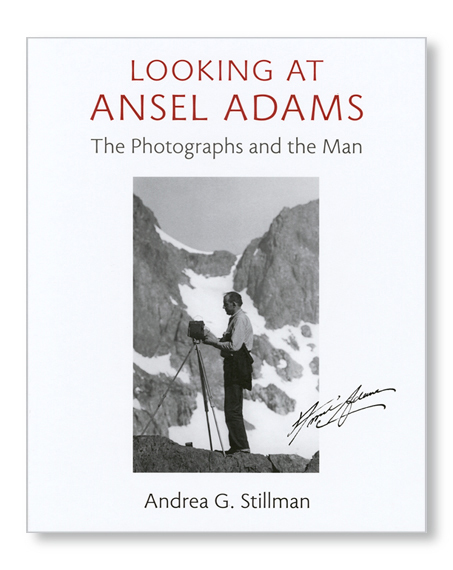 I think anyone that is interested in Ansel, and his photography, will find this book to be most fascinating... however, I am a bit biased - having contributed, in a small way, to this project. "I eagerly await new concepts and processes. I believe that the electronic image will be the next major advance. and the artist and functional practitioner will again strive to comprehend and control them." MX and Little, Brown and Company are about to release a companion app of the same title. This new app, for the Apple iPad and iPhone, really brings the stories and images in the printed book to life. Amazingly, the basic app is absolutely free, and will soon be available from the Apple App Store. The anticipated launch date is next Wednesday, September 19. The free app includes material augmenting three of the book's chapters. It includes Print Explorer, which offers an interactive presentation of Ansel's evolving vision and craft in the darkroom featuring Ansel's iconic image Winter Sunrise. In addition the free app includes letters, postcards, movies, a preview Gallery section, along with Stories & Images that includes photographs, audio, and notes from three chapters of the book. The complete app, which can be purchased from within the free app, adds additional content to all of the sections. The Gallery shows all of the twenty key images in the book, and includes a slide show option with narration. There are additional photographs in the Print Explorer featuring Ansel's iconic images, Moonrise, Frozen Lake and Cliffs, and Mt. McKinley, Wonder Lake. The Stories & Images section includes more than 200 images-many with insightful audio comments by Andrea as well as informative captions. The unique Location Explorer allows you to see the approximate map location where Ansel made the twenty key images in the book. The complete app is only $2.99 for a limited time. But wait there's more... enhanced and additional content will be added to the app soon to provide an even more rewarding experience. It sounds like a middle of the night infomercial, but the app really does deliver all of this for a very reasonable price. The book and the app blend wonderfully to compliment one another and create an entirely new way to experience Ansel's images and his life. Anne and I find both the quality and quantity of content provided in the app amazing. Ansel's photographs look fantastic on both the iPad and iPhone. The reproductions have been optimized to take full advantage of Apple's Retina Display. I think the iPad version is the best way to experience the app, but it also looks terrific on the iPhone. It's simply a matter of screen size. In this instance bigger is better. This is a "universal" app - one download, or purchase, will allow you to use it on all of the Apple iOS devices registered to one iTunes account. It is a fantastic bargain. It is also a great excuse to now purchase a new iPad, or the recently announced iPhone 5!!! Last week we were visiting with Ansel and Virginia's daughter Anne Adams Helms and her husband Ken. We had the opportunity to share a preview version of the iPad app with them. They both enjoyed the experience greatly. Anne said it best when at one point she exclaimed, "I could play with this for hours!" I second Anne's opinion. 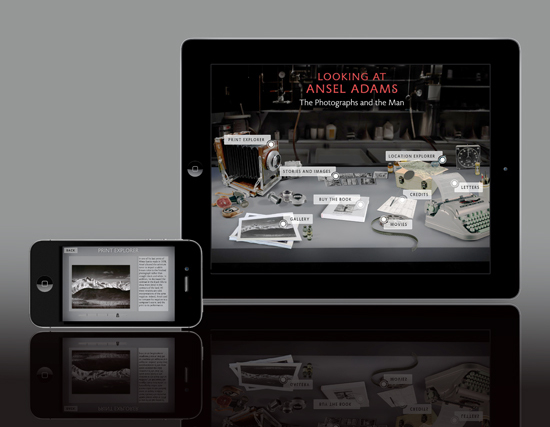 The Looking at Ansel Adams iOS app will soon be available in the Apple App Store. © Copyright 1998-2012 John Sexton. All rights reserved.